Well, we all knew this was coming. It’s the last day of NaPoWriMo 2015! Congratulations to everyone who made it through the month. And if you didn’t quite get to 30 poems, don’t worry – there’s always next year! Our final featured participant is Moonbows and Sundogs, where the review poem for Day 29 seems to place us somewhere beyond mere opinions. And today’s poetry resource is Coldfront, an online journal of poetry, reviews, essays, and more. You might be interested, for example, in their Poets Off Poetry feature, where poets write about their favorite albums. It’s the penultimate day of NaPoWriMo! (I’ve always liked the word penultimate). Our featured participant today is Bonespark, where the bridge from Day 28’s poem is just a piece of string. Today’s poetry resource is Poem in Your Pocket Day. Held annually since 2002, this year PiYP Day is April 30. (I thought I would feature the project today to give you time to find poems for your pockets). And now, for our prompt (optional, as always): today, I challenge you to write a poem in the form of a review. You can review either animate or inanimate things, real places or imaginary places. You can write in the style of an online review (think Yelp) or something more formal that you might find in a newspaper or magazine. (I imagine that bad reviews of past boyfriends/girlfriends might be an easy way to get into this prompt, though really, you can “review” anything in your poem, from summer reading lists for third graders to the idea of the fourth dimension). And we have two featured participants today, because I just couldn’t pick! First, Yoga Mom’s hay(na)ku lament for unseasonable weather, and then Summer Blues, where there are two poems, a single noir-ish hay(na)ku, and then a three-stanza variant, which I found very evocative. Today’s poetry resource is Lemonhound, where you’ll find poems, reviews, poetics and craft essays, and more. And now for today’s prompt (optional, as always). Today, I’d like to challenge you to write a poem about bridges. A bridge is a powerful metaphor, and when you start looking for bridges in poems, you find them everywhere. Your poem could be about a real bridge or an imaginary or ideal bridge. It could be one you cross every day, or one that simply seems to stand for something larger – for the idea of connection or distance, for the idea of movement and travel and new horizons. Just four days left now – we’re almost to the finish line. Our featured participant today is EmmaJewel, where the persona poem for Day 26 is also a calligramme! Today, our featured resource is the Academy of American Poets’ postcard archive, where you’ll find advice to young poets and some oddball summer ephemera, all written in postcard form. Our featured participant today is Linda Kruschke’s Blog, where the clerihew for Day 25 rather cleverly forces you to complete the final rhyme. Today’s featured poetry resource is The Volta, where you’ll find new poems, video poems, interviews, craft and critical essays, reviews, and more! I also wanted to give a shout-out today to a project created by Gloria D. Gonsalves, who has been participating in NaPoWriMo for many years. It’s World Children’s Poetry Day, taking place this year on October 3. Keep your eye on the website as autumn rolls around! Perhaps you might consider organizing an event in your community? And now, for our prompt (optional, as always). Our last two prompts have been squarely in the silly zone – this one should give some scope to both the serious-minded and the silly among you. Today, I challenge you to write a persona poem – a poem in the voice of someone else. Your persona could be a mythological or fictional character, a historical figure, or even an inanimate object. Need some examples? Check out this persona-poem-themed issue of Poemeleon from a few years back. Hello, everyone! We’re really starting to wind down now. I’ll miss this – and you! Today’s featured participant is From the Corner Out, where the parody for Day 24 updates “The Road Not Taken” for the cell-phone era. Our featured poetry resource today is The Favorite Poem Project, the online presence of a large-scale effort spearheaded by former U.S. poet laureate Robert Pinsky, to foster interest in poetry by collecting and showcasing Americans’ favorite poems. You’ll find videos of people reading their favorite poems, along with text of the poems themselves, as well as information about the history of the project and the various books, DVDs and other materials that it has engendered. It’s the final Friday of NaPoWriMo! Our featured participant today is J Luukkonen Poetry, where the six of spades from Day 23’s card-based prompt becomes six spades digging the earth. Today’s featured resource is the The Library of Congress’ Poetry Resource Page, which will guide you in exploring the poetry-related content of the library’s website. You can find all kinds of things, including the state poem of Tennessee, the emo love poems of a teenage George Washington, and other wonders and oddities. Hello, everyone! There’s just one week left now! I hope your poetry muscles are keeping pace. Today, our featured participant is Graceful Poetry Press, where the Earth Day poem for Day 22 has both gratitude and a sense of melancholy. Our poetry resource for the day is From the Fishhouse, an audio archive of emerging poets. Here, you’ll find a host of interviews with poets, as well as recordings of poets reading their work. Hello, all, and welcome back for the 22nd day of NaPoWriMo! 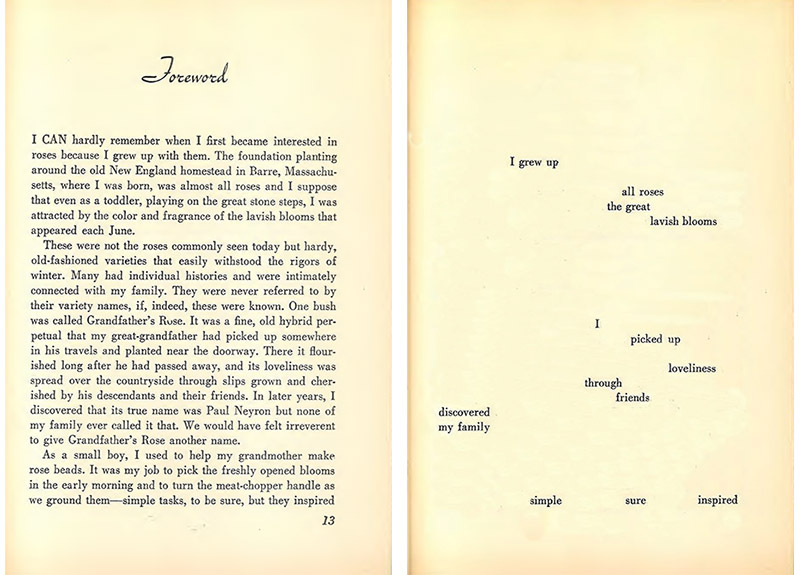 Our featured participant for the day is: Alphabet Salad, where the erasure poem for Day 21 comes out of a page from Walden. Today’s poetry resource is Empty Mirror, an online literary review. The site, which started out as focused on Beat Generation writing, now publishes new poems, book reviews, interviews and more! Hello, all. Today marks the end of the third week of NaPoWriMo. We’re getting near the finish line now! Today’s featured participant is Whimsygizmo, where the “I know” poem has a restless sort of melancholy, the sense of taking stock and summing up before continuing on. And our poetry resource for the day is Leslie D.’s NaPoWriMo poet interviews. Blogger Leslie D. is not just writing poems each day for NaPoWrimo; she’s interviewing a poet every day!